UK holidays with dogs can be a real treat and a much easier option to taking your dog abroad. Whether you are lucky enough to live local to the Norfolk Broads, or if you’re planning a boating or cottage holiday here, the Broads has a lot to offer our canine friends. There is an abundance of dog friendly walks around the Broads and dogs are also welcome at a number of attractions and in many pubs, restaurants and cafes. Dogs are welcome in most open places, such as walking trails around the Broads. However, be aware that dogs are not usually allowed on nature reserves – dogs are not permitted at the RSPB Strumpshaw Fen Nature Reserve due to the careful preservation of the area for domestic and migrating birds. There is also a section of Whitlingham Broads in which dogs must be kept on a lead for conservation reasons. For your dog friendly holiday, Salhouse Broad is a great place to moor with your dogs. There is gentle slope into the water for any dogs who like to paddle, and a wooded path to the village which either takes you to the Fur & Feathers pub, which permits dogs to sit outside in their beer gardens. Great Yarmouth is also a lovely place to walk your dog. Dogs are permitted on the North Beach which is north of the pier. There is an expanse of grassland with plenty of smells and hidden areas for dogs to explore! Many of the cafes in the town will allow you to sit outside and enjoy a coffee with your dog too. Dogs are welcome at the Fairhaven Woodland & Water Gardens, provided they are kept on the lead (25p per dog) and they’ll even provide you with a poop scoop to tidy up after your pooch. Dogs are also permitted to sit outside the café at Fairhaven. Wroxham Barns welcome dogs on a lead, although there are some restrictions to where dogs are permitted, such as the Junior Farm and inside the shops. Broads Tours’ river trips permit a limited number of dogs for £1 per pooch – taking you and your dog on a guided tour of the Broads from Wroxham with expert commentary from their experienced skippers. Or you could take out a Broads Tours day boat and your dog can join you for free! The dog friendly attractions help to make your UK holidays with the dog easier so that your four-legged friend doesn't have to miss out! Most pubs on the Broads will allow you to sit outside in the beer garden with your dog. The Bridge Inn at Acle will also let your four legged friend join you inside. The Swan Inn in Loddon are very welcoming to dogs and will be more than happy to give yours some affection and a bowl of water. The Maltsters at Ranworth allow dogs to sit by their fire in the winter and bathe in the sun in the summer months. The King’s Head in Hoveton have one dedicated room in the pub where dogs are allowed and they even have dog treats available! The White Horse at Upton, The Ship at Reedham and The White Horse in Neatishead are also pubs which will allow your dog in their bar areas and in their beer gardens. Dogs are very welcome on all of our holiday cruisers. Dogs are charged at £25 for a short break or £40 per week with a maximum of 2 dogs per cruiser. We also have a limited number of lifejackets for dogs for which we charge a refundable deposit of £20. Many of our customers take advantage of our dog friendly boat holidays and we've always received good feedback from them about their holiday. There is plenty to do, with walks on your doorstep at many moorings and lots of pubs and cafes around the Broads welcoming dogs to either sit outside or enjoy a quiet lay down indoors. You'll find many locals enjoying Broads walks with their four legged friends so there'll be plenty of other pooches to keep your dog company! Always check local signage to ensure that your dog is welcome wherever you choose to go, or check websites in advance. Never let your dog jump from the boat to the bank before you have properly moored. This avoids any risk of your dog either slipping between the boat and the bank, or you being unable to keep control of your dog from the boat if it is on the bank. If your dog falls overboard, we would strongly advise you not to get into the water to rescue your dog. Where possible, direct your dog to a bank where it can climb out or where you may be able to help it out of the water. Keep close control of your dog at all times when off the lead and be aware of other Broads visitors. 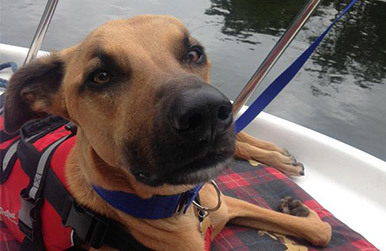 If your dog is not on a lead when on the outside of your boat, we recommend using a dog life jacket. The newest addition to our Broads holiday family is Bure Lodge – a newly refurbished holiday home in Wroxham. We are very happy to accept dogs for free with guests staying in Bure Lodge (max 2) and it is an ideal base for exploring the Broads with your dog. There are many dog friendly beaches in Norfolk, including Winterton and the North Beach at Great Yarmouth, both permitting dogs all year round. There are also lots of walking routes around the Broads and pubs, cafes and attractions that allow dogs. Our holiday cottage in Wroxham is a great place to explore the Broads by water, with our sister company, Broads Tours, allowing dogs on board Day Boats and River Trips. 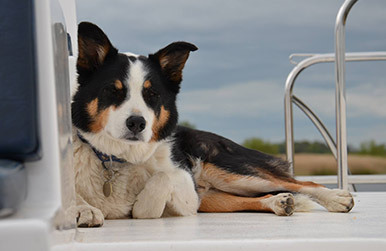 Hiring a Day Boat with your dog gives you the freedom to navigate the Broads at your leisure, and make stops along the way at your favourite walking spot or dog friendly beer garden, dogs are free on the Day Boats too. 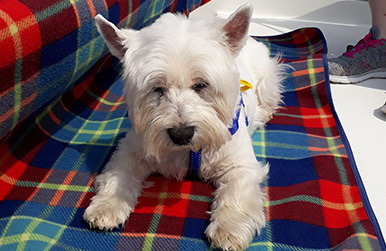 At just £1 per dog, the River Trips are a fantastic way to expand your Broads knowledge as our skippers provide expert commentary on your cruise along the river. Please do not allow your dog on the furniture, including the sofas and the beds. Please pick up your dog’s mess from the garden of the Lodge and dispose of this with your refuse. Always pick up after your dog when you are outside of the cottage and dispose of waste in designated bins. Bure Lodge is located in a residential area so please keep close control of your dog when you leave and return to the property.